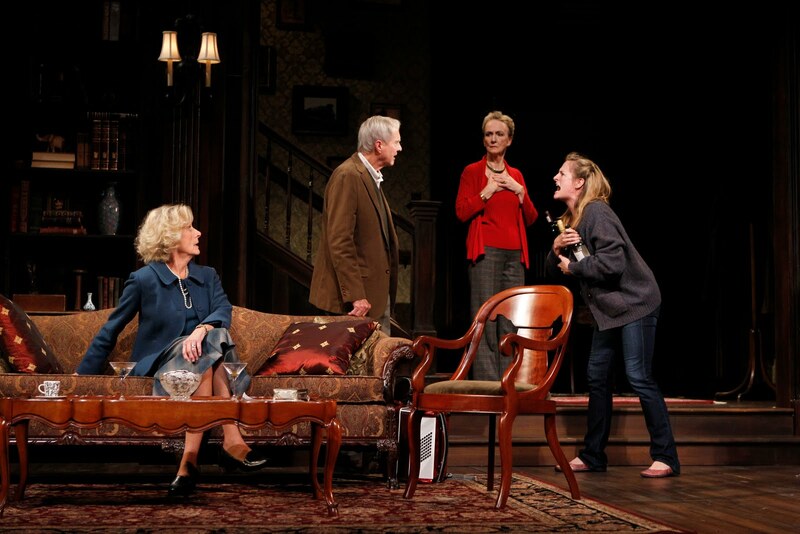 in Edward Albee's A Delicate Balance. Photo © Joan Marcus, 2010. Life’s A Delicate Balance thrown out of equilibrium by choices that we and others make, but when too many choices pile on the scale, it tips, leaving few choices left for fixing it. That’s the crux of Edward Albee’s play -- the one that won him his first Pulitzer-- now playing at Yale Rep. The theater’s artistic director James Bundy guides the three-hour, two-intermission angst fest which features good performances, but a frustrating plot as characters forced into close living quarters find themselves teetering between sanity and madness. Edward Hermann plays Tobias, a laid back guy trying to stay that way while dealing with the reality of his loveless marriage, his sister-in-law’s drinking problem, his daughter’s failed fourth marriage and unexpected house guests. His methods of coping involve drinking, staying up all night to find some alone time and -- at least at one time --, engaging in an affair, possibly with sister-in-law Claire (Ellen McLaughlin). His wife, Agnes (Kathleen Chalfant) is the self proclaimed “fulcrum” trying to maintain the balance in all this mess, but it’s hard when she has to confront Clare about her drinking, deal with some mentally unbalanced rants from daughter, Julia (Keira Naughton), and entertain uninvited guests all while musing about what a relief it might be to lose her own sanity. Inserting themselves into this mess are Harry (John Carter) and Edna (Kathleen Butler), life time friends of Tobias and Agnes, who, driven by some unknown and unexplained fear, arrive on the doorstep of their suburban home (lavishly paneled and bookcased by set designer Chien-Yu Peng) asking for a permanent place to stay. While each of the performances is strong (McLaughlin stands out as the sarcastic, wise-cracking Claire), they fail to tip the scales back from the weight of a contrived and confusing plot and characters that aren’t very likeable to justify a three-hour visit with them. Before it’s done someone has threatened -- either seriously or in veiled conversation -- gunfire, a bomb explosion, the plague and burning bodies and belongings as ways to deal with what they want. Oh, and Claire also plays the accordion and yodels. This scale needs some recalibration before it will find A Delicate Balance , but you can see the fine performances through Nov. 13 at Yale Rep., 1120 Chapel St. at York Street, New Haven. Performance times vary. Tickets range from $10 to $85 and are available at 203-432-1234 or www.yalerep.org. Well handled, Lauren, as always. And then there's the dead child . . . Why was he thrown into the conversation? This one certainly did nothing to turn me into an Albee fan.